Several studies were carried out featuring various aspects of Vellayani Kayal; an important wetland and a perennial source of fresh water in the southern part of Thiruvananthapuram district, Kerala State. This is locally known as Vellayani Kayal (Vellayani wetland or lake) is located at 8°25'35.21"N and 76°59'35.87"E. The Vellayani Kayal is the major source of drinking water for the people of Kalliyoor, Venganoor and Vizhinjam gram panchayats. This is also important for food safety on account of paddy cultivation in the area. Over the years, this wetland has reduced in area. During monsoon season, large quantity of water is drained in to this lake and the water reservoir is protected with suitable spillway mechanism. There were few studies relating to various aspects of this important wetland. An attempt was made to compute the water balance by National Centre for Earth Science Studies (NCESS), now a Government of India (GoI) Research organization. In this paper, the water balance of the Vellayani Kayal is suggested to recompute considering the grey areas of water balance results derived by NCESS. Although NCESS tried to finalize the water balance equation, the assumptions behind the water loss and gain through inflows remained unidentified. The reassessment and analysis based on the new findings shall possibly provide the details of more accurate water loss and inflows. In the same context, the ambiguity behind the origin/source of this important wetland was also resolved paving way for better management of the lake and this precious water resource of the region. During 2013, as part of the study, the area has been mapped with the help of SoI topo sheets and satellite imageries coupled with very high level ground truth verifications for the sole purpose of augmenting the water supplies in the region. The geologic studies including lineament mapping using Remote sensing techniques were also helpful for identifying the origin and evolution of this important coastal wetland. This has ultimately resolved the issues and made possible to compute a more acceptable water balance. The Vellayani Lake is an important coastal wetland located south of Thiruvananthapuram and north of Vizhinjam fishing harbor between coordinates 8°25'35.21"N and 76°59'35.87"E (Figure 1a). This wetland, spread over an area of 750 Ha in 1926, was reduced to 397.5 Ha by 2005 . The length of this linear shaped lake is 3.7 km with a maximum breadth of 2.1 km and a maximum depth of 3.0 m . Currently this fresh water lake is a major perennial drinking water source for water supply to the people of Kalliyoor, Venganoor and Vizhinjam gram panchayats. The slow but steady urbanization and scarce land resource in Kerala has put the wetland at risk by encroachments as well as land use changes . On account of lower depth its peripheral areas are subjected to intensive paddy cultivation . Not much research work is carried out on all dimensions of this wetland. Geomorphically, catchment of the Vellayani lake falls within the lowland region (10-100 m), lying to the South East of the coastal plain of Thiruvananthapuram district. The area receives rain from two monsoons and pre-monsoon and summer showers and has a 50 years average of 218 rainy days an year . The hydrological map of the area showing drainage pattern (Figure 1b). Figure 1: (a) Location map of study area; (b) Hydrological map of study area. The earlier study mainly attempted for water balance computations and has come out with some results which are not conclusive due to non-availability of sufficient quality data. The study could not conclude the larger water loss and inflows component to groundwater relating to water balance computations . According to Quaternary regression  concept, the tidal waters had reached much inward along the lower basin of Karaman River and also along the basin of its then existing tributary from the south and the area of the tributary basin had been totally submerged transforming itself in to an extensive shallow water body. Tidal incursion and the consequent flood situation had prompted meandering in the course of Main River also subsequent to the regression of sea later the deeper portion of tributary became the Vellayani Lake . The recent detailed ground studies in this area using various techniques including remote sensing could bring in lot more clarity on both water balance and the origin of the lake itself. This paper attempts to bring out a more logical and rational approach towards the evolution of the lake Figure 2. Figure 2: Cross sectional sketch of the Vellayani lake . The methodology followed included the direct and indirect analysis of various satellite imageries (Table 1) and Survey of India topo maps 58-D-15 NE and SE, 58-H-3 NE and SW. The project area was studied in detail with several resources (Table 1). The geologic map of the study area  was also analyzed for supplementing and for deriving logical conclusions. Drainage basin map was prepared as shown in Figure 1b using Aster DEM Image, 2011. Further, computer aided lineament mapping was carried out visually due to the extensive knowledge of the terrain (Figure 3b) during the course of studies with various levels of information available from time series satellite data . The various evidences based on ground level knowledge were assembled together to get reliable results i.e., to meet the objectives of this work. Further the results have been correlated with the natural geographic projection towards sea at Vizhinjam (Figures 4a and 4b) described as Kovalam headland . The satellite data from Landsat and Indian Remote Sensing (IRS) Satellites (Table 1) were directly and indirectly available for varying levels of visual analysis of the terrain. Figure 3: (a) FCC imagery showing all natural elements such as roads, streams and vegetation aligned in such a way to reflect the Tectonic forces acted up on the area; (b) Lineaments delineated. The other linear features are more or less shear forces that is hard rock’s developed as fractures which were later evolved as valley fill areas. Figure 4: (a) Synoptic view of kovalam headland with a much larger area to show case the sea ward land projection due to the tectonic forces; (b) Protruding N-Bloc where the hard rock area is present. The inset image shown in is a zoomed area of the tip with Vellayani lake. Table 1. Satellite data incidental to evaluate the findings. Recently the same area was subjected to detailed studies relating to a Comprehensive Environmental Impact Assessment (CEIA) for development of International Deep water Multipurpose Seaport at Vizhinjam  and this is a ramification of the CEIA study. A number of in-depth studies and analysis were carried out separately for road-rail connectivity to port, ancillary sites for developing an integrated CEIA . As a part of the Shoreline change studies; time series satellite imagery data by INCOIS  was also available for visual observations and analysis of the terrain. Geologically the area comprises of oldest originated khondalites and then charnockites, laterites, and varkalli formation followed by recent sediments and pebble beds as per the stratigraphic succession of Kerala . The exposures of charnockites are mostly towards NW of Vizhinjam fishing harbour and khondalites are towards SE. Most of the hard rock exposures are spreading along the coast from north of Kovalam to Vizhinjam and beyond up to Adimalathurai . It is found that khondalite rock is exposed as hard rock at the north eastern part of the bottom of the lake . The lateralized khondalite suites of rocks are seen all around the Vellayani Lake and at one location along the sea coast south of Vizhinjam harbour. Altitude wise, the catchment area stands out as a prominent, low level, highly dissected laterite plateau. The Cross sectional Sketch of the Vellayani Lake is provided in Figure 2. From the lineament mapping it is revealed that the Vellayani Lake is formed along a major lineament possibly a fault line extending up to the Vizhinjam fishing harbour through Gangayar at South (Figure 4a) and towards north it is extending far beyond Vellayani Lake . This is clearly exhibited by the two separate stream courses farther north of Vellayani Lake almost aligning along the fault lane (Figure 1a) with the acceptable level of error due to various reasons in mapping, and later geomorphic forces shaping the geomorphology of any terrain for that matter. Apart from techtonic forces, the shifts in the stream courses in the map are due to inaccuracies in the Geographic projection and mapping. The edge of the continental shelf of the western coast is remarkably straight as it is a fault line formed in late Pliocene . The geotechnical study has further confirmed that this lineament fault at Vellayani Lake is not continuous towards the seabed . After Miocene period Varkala sandstones were laid down and they were raised up and the coast was faulted down simultaneously with the faulting of Makran coast . Therefore geologically age of the Vellayani fault cannot be different. The Southern (or Eastern) bloc along Gangayar vertically moved upwards towards North (displacement could be of the order of 0.3 to 0.7 km) with a small angle of rotation/folding (From NNE to almost North direction) and the Western block moved vertically downwards towards South (Figure 3a). This has resulted in the formation of the present bay at Vizhinjam fishing harbour. The Northern/western block movement could be a minor displacement. All along this lineament of 10 to 15 km long and the satellite imagery reveals this particular displacement. The second major lineament is formed as a shear (zone) where hard rock exists towards coastal area zone and is adequately wide to develop almost a 0.3 km wide valley fill area which is a seasonal wetland by definition. The presence of a dozen water storage structures formed out of springs from fracture zones are also an indication of lineament along the valley fill and aquifer connections to Vellayani Lake. The nature of this valley fill with linear nature, and wide body also confirms the kind of tectonic forces played during the formation of the lake. The concept of tectonic evolution as per this paper, need to be seen in combination of earlier transgression concept to explain the tectonic dimension of lake formation. This being the largest fresh water reservoir of Thiruvananthapuram the capital city of the State of Kerala it has much ecological and environmental significance. However the various studies carried out here are not in-depth and does not cover all dimensions the region including hydrology (also groundwater), ecology, Environment, Flora and fauna (including migratory fauna), Geology, socio cultural aspects including agriculture, etc. This paper attempts to unearth a small part of such in-depth studies. This was unraveled during an Environmental Impact Assessment (EIA) carried out for the Vizhinjam International Seaport about 5.0 km away from the lake towards south western side. The Kerala state always had the food security issue in the economic agenda and there were several efforts to tap this wet land only for paddy cultivation. Any such unidirectional attempts to exploit only for agriculture without in depth studies of the ecosystem will be detrimental to the regional ecosystem and for the sustainable development of the region. The above referred EIA also directed the authorities to do more study of the region that could also protect the lake and to maximize its use in all aspects of environment and ecosystem for the socio-economic benefits to not only to communities around but also for the planet in terms of climate change. Beside the natural drainages and considering geologic time scale, the area is assumed to be without any wetland in the geologic past. Available evidence suggests that south western coast of India should have been alongside the East coast of Madagascar in pre-drift times . After the formation of the Indian plate, the tectonic forces within the plate as well as the forces acting along the plate boundaries directed the Indian plate to move @ 20 cm/year towards NE direction resulting in the formation of Himalayan mountain ranges . Considering the geologic time, these forces were also building up local tectonic disturbances in the same direction within the land side body of the Indian plate. This is truer considering the fact that Indian plate is the thinnest and fastest of all plates. The lithospheric roots in South Africa, Australia and Antarctica are between 180 and 300 km deep, whereas the Indian lithosphere extends only about 100 km deep . While the anthropogenic surficial forces  that could be a triggering as catelistic forces the plate induced movements are playing larger/primary cause of 1000s of very low to high intensity earth quakes at various locations in India including Latur earthquake of 1993. At Vizhinjam the forces over a period of time initially developed a fold axis (Figure 3a). Later along the fold axis, the brittle rocks developed a joint plane considering geologic timescale. Away from the coast, with Vizhinjam as centre, like the movement of clock needle the fault plane has rotated anti clock wise by about 40° positioning to current location along a more or less N-S of the fold axis slightly tilting (~2 degrees) towards east. This could create the Vellayani basin (wetland) and its subsurface connection through the lineament to the northern streams as evident from Figures 3a and 3b. The Figures 4a and 4b and the inset photo area show the Kovalam headland. This head land (projected area to sea) is composed of hard rocks. This remains intact strongly against hydrodynamic forces and monsoon of thousands of years acting along this shore. The water retention in Vellayani Lake could be attributed to the relatively close nature of the fractures towards the coast due to complex folding and possibly due to the fault line developed as a result of tectonic forces from South and East. All these are due to the presence of several older hard rock geologic formations present underlying the recent formation . This direct hidden connection to sea refutes the theory that there is no outlet to this wetland as reported” there is no out let to the sea” . This process has also resulted in the basin formation near Vellayani, where lake was formed closing almost all natural outlets for the water to drain out (Figure 5a) directly to sea through a short cut. This is particularly true towards E and primarily from S direction from where the tectonic forces originated and were active. Originally at the time of genesis of the fold axis, it was already geographically at near 45-50oNE almost perpendicular to the immediate west coast line. The nature of drainage pattern and other surficial features in the southern bloc of fold axis clearly exhibits this characteristic of the concept. Further adding more evidence is the drainage north of Vellayani Lake for about 15 km the continuation of the geologically weak zone aligned along the same fault plane up to Aruvikkra in the upper reaches of Karamana River. Figure 5: (a) An aerial view western end of fault zone out cropping near shore draining to sea; (b) Stream course along fault near fishing harbour is altered stream course due to human interferences. A water gauge was established at the Kerala Water Authority (KWA) pumping site on April 20, 1999. Water level and pumping details on a daily basis was recorded both at the KWA and the Central Public Works Department (CPWD) pumping stations, and the data thus generated for the period up to December 31, 1999 together with daily rainfall and evaporation data recorded at the Meteorology Department of the Agricultural College, Vellayani, is used for the calculation of water budget of the lake for water balance only one good attempt was recorded . Although the depth of the N-S lineament is difficult to assess (>80 m) without geotechnical investigations, with the current level of study, it is imperative that water is being continuously drained along the lineament plane to sea as well and other lineament connectivity as evidenced by a number of springs . The width of influence of tectonic forces that include folding and faulting could be as wider as “average lake width” that is less than 2.0 km and as low as 2-3 m at the sea shore near harbour. Apart from surface flows there could be substantial subsurface discharges towards the sea vertically down through the lineament plane at Vellayani lake area and inflows from far towards north is deep below the laterite capping. The total estimated length of the lineament (with indication of faulting) could be >15 km. While the southern side drains the water to Sea, the North side brings in lot of subsurface inflows to the lake from the two other streams especially during the monsoon season. The pressure from south has resulted in the movement of the southern block landward and northern block seaward of the area towards sea which is now described as Kovalam headland . This Kovalam headland is formed of by hard rock formation of charnockites and older khondalites . The head land has become more prominent due to the shore line erosion far beyond hard rock areas towards North side and accretion at Adimalathurai. It is evident that the hard rock areas are largely unaffected by coastal erosion and shore line changes. Any shoreline change occurring at these locations are cyclic and that repeats for centuries without any loss of land as far as human beings are considered. The new attempt is largely based on the water retaining portion of the tectonic forces and the hydrologic connection to the two streams towards northern side. These two factors are vital for computation of water balance of the lake. In the absence of actually measured run-off data for stretches of Karamana basin, runoff at Vellayani catchment is taken as 40% of the monsoon (June-November) rain, analogous to the Sasthamcotta catchment, and evaporation as actually measured at the Meteorology Department of the Agricultural College located adjacent to lake. The catchment area feeding the perennial water body (excluding the paddy fields to the north east of the pumping stations) has been taken as 21.00 km2 , although the total area of the catchment brimming Karamana River is 38.03 km2. Continuous outflow of water from the lake through the Madhupalam sluice and periodic breach of the bund have placed constraints on water budget computations, especially in working out the base flow component. Pumping of water by KWA and CPWD is reported to be around 0.36 Million m3 Evaporation losses have been calculated at 2.074 Million m3 for the study period. This amounts to an annual outflow of 2.434 Million m3 of water from the lake. The inflow through direct rainfall and surface run-off has been calculated as 15.14 Million m3 during the period from April 20, 1999 to December 31, 1999. The residual storage at the end of December, 1999 was around 3.9 Million m3. This would mean that huge quantities of water are breach. Earlier approach was basically based on the visible measurable hydrological aspects at various point of time and thus they were helpful only in partially working out the base flow component. This main drawback of this approach is the un-accounted groundwater outflow to the sea and also the inflow from the upper reaches from north along the lineament. The water budget has been calculated with similar parameters such as Precipitation, Evaporation, Runoff and Groundwater flow as considered in  to obtain a correlation between the earlier and the latest computation. Table 2 provides a comparison between the two computations. Based on the water balance computation values arrived by , it doesn’t provide a detailed breakup of inflow and outflow measurement. The difference in the inflow and outflow shows that there are various other possibilities to influence other than the parameter that are considered for calculation of Precipitation, Evaporation, Runoff and Groundwater flow. This also supports the idea of geologic activity and the evolution of the Lake is formed along the lineament. Table 2. Water balance calculated. With current methodology; taking in to account the inferred tectonic shift along the Lineament (weak plane) it can be assumed that this has resulted in the formation of current bay at fishing harbor. Further the missing water could be attributed to the inflows and outflows of water along the Lineament plane and its tectonic connections. Out flows are from Sea to down south through surface and subsurface means. The water was missing along the weak zone (lineament) lying almost along North-South direction slightly shifting towards east. The anticlockwise rotation of the Lineament or joint plane is exerting pressure towards the lake from East this explains the holding of water due to closing off all fissures to a large extent. When compared with this result of the geologic formation, it was discovered that some part of the lineament follows the geologic contact between the older charnockites and later khondalites. The movement with relatively stationary position of the N bloc towards S has created a permanent projection “the Kovalam headland” as shown in Figures 4a and 4b. This is a stable land mass composed of hard charanockites and khondalites rarely seen lateralized as observed at one location south of Vizhinjam and at many places near the wetland area. This stable land mass Vizhinjam - Kovalam belt is also protecting the coastal areas from further erosion along the coast at these length. This work urges need for detailed studies in the similar grounds to understand the complete scenario with regards to geological, geophysical and hydrological and hydro geological environment of the Vellayani coastal wetland. Detailed studies are also required to establish the relationship with regards to charnokites, Fault plane and Khondalites and the depth of the fault plane up to which Subsurface flows are taking place through the otherwise naturally jammed lineament. The quaternary regression during Miocene needs to be thoroughly relooked in the light of these new findings. Water balance in the wetland bodies are to be conserved considering the present and future requirement of the fresh water from the available inland water bodies. Throughout the world and especially in the drought lands and island regions lack of fresh water is a major concern. This work is an example study which was conducted on Vellayani Kayal, a renowned fresh water resource in Kerala with regard to computing the water flow applying a novel methodology which is not based on mere observations. We expect this study has provided good insight into the water flow direction from all perspective for the defined study area. Moreover, this study may provide inspiration to the future similar studies pertaining to different important water bodies. The Authors acknowledge the support given by the Management of L&T Infrastructure Engineering Limited to publish the paper. The authors are also thankful to the entire staff of the Environmental section of L&T Infrastructure Engineering Limited for all their support given for the preparation of this paper. Our special Acknowledgements are to the two draftsmen Mr. A. Swamy Naidu and Mr. B. Navin Kiran for all the support given for the finalization of the paper. No amount of acknowledgements will be sufficient to thank Vizhinjam International Seaport Limited team; especially Mr. Suresh Babu, Chief Executive Officer & Mr. Ajit, Chief Project Co-ordinator, and his team specifically Mr Pradeep, Engineer for his sincere support for some key data collection to complete the work. 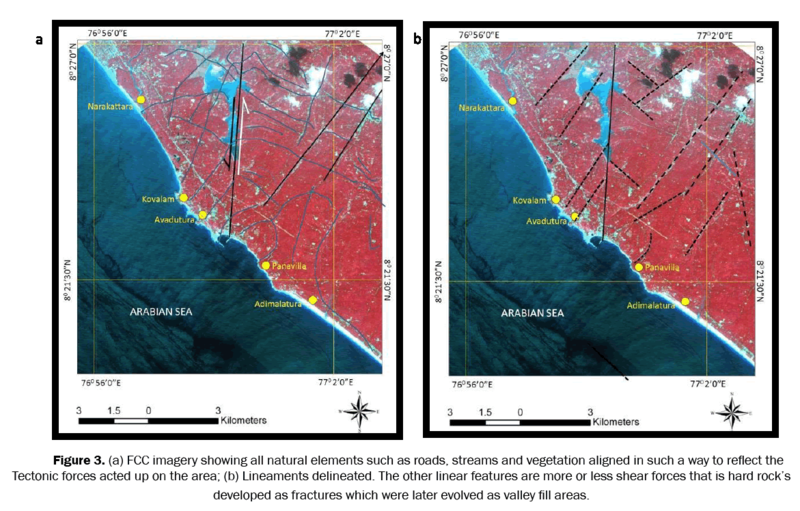 Radhakrishnan Nair P. Fracture Aquifers of Thiruvananthapuram Coast - Agricultural and Ecosystem Management Group (AGES) - Research Report, Kerala State Council for Science, Technology and Environment. Thiruvananthapuram. 2007:1-38. Soman K. Conservation of Vellayani Lake in Trivandrum District as Drinking Water Source- Detailed Study, Centre for Earth Science Studies (CESS), Thiruvananthapuram. 2000. Krishnan MS. Geology of India and Burma. CBS publishers, New Delhi; 1982. Kumar P. The Rapid Drift of the Indian Techtonic Plate. Nature. 2007;449. Rajendran CP. Reassessing the Earthquake Hazard in Kerala Based on the Historical and Current Seismicity. Journal Geological Society of India. 2009;73:785-802. Prasada Rao. Agricultural Metrology. PHI Learning Pvt. Ltd, New Delhi; 2008.